1. Combine all the ingredients above in a medium mixing bowl. Blend well and spoon 1/2 c. of the mixture onto each slice. 2. In a toaster oven, toast slices on medium/medium-high setting and serve hot. A family favorite! 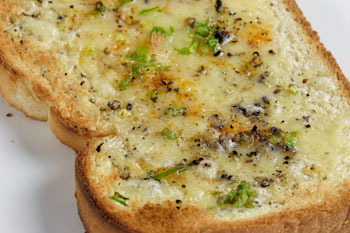 The flavor of cheddar blends surprisingly well with the garlic and fresh chilies when toasted. This dish is spicy but very tasty! You can substitute low fat mozzarella cheese for cheddar.